Euston station is changing, with HS2 Ltd preparing for construction, and Network Rail, Crossrail 2 and Transport for London also thinking about how to design the station. A fully redeveloped, comprehensively designed Euston station would create the potential for a new piece of city, maximising new homes, open space and new routes through and around the station. 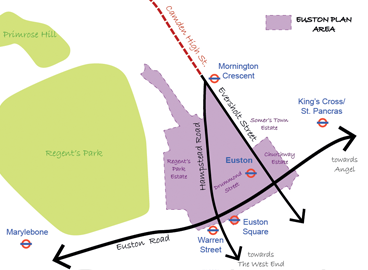 Camden Council is planning for the future of Euston by producing long-term frameworks for development in the area, working with the Greater London Authority and Transport for London. We are developing a draft Planning Brief for the Euston station area, which we will consult on later in 2018.